If you are experiencing any problems with your disposal our technicians are available to service and repair your appliance same day! 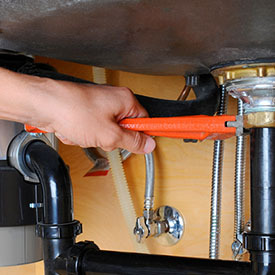 Plaza Appliance staffs a team of fully trained technicians, who can attend to all types of garbage disposal repair. Our technicians will arrive at your location, diagnose the problem and provide an immediate fixed upon request. Many of the problems with garbage disposals are quite common. There are some very everyday problems fixed by the professionals at Plaza Appliance. No Power – A garbage disposal is not immune to overheating, which leads to a lack of power. This is can be caused by an ordinary jam. However, it can also be caused by a motor that has been worn down over the course of time. Getting to the source of the issue is something that requires a complete look into the system. Clogs – The majority of serious clogs in a garbage disposal will not be cleared with a home remedy or DIY method. This will require a professional to use a snake or other methods that are part of professional disposal repair. It may also require the trap to be disassembled. A technician can attend to these issues with ease and provide a quick fix. Multiple leaks – If one leak is not enough, more than one will signify that it’s time for disposal repair. There are some leaks that will require a new system to be installed. But there are also leaks that can be fixed with disposal repair. Leaks that are located in the unit’s body may require more comprehensive work than regular disposal repair. Jammed disposal – A garbage disposal can become jammed by various objects or debris. Trying to fix a jam yourself can be very dangerous as the blades could do a significant amount of damage. Instead of messing around with any of those components, it is best to call a professional and let them do what they do best. Loud and unnecessary noise – Disposal repair is definitely an option when there are loud and unusual noises coming from your system. This could be a result of loose screws or worn out blades. There are also other causes, all of which can be fixed by the trained technicians at Plaza Appliance. At Plaza Appliance, we attend to issues on all types of garbage disposals. This includes disposal repair on continuous feed garbage disposals as well as batch feed varieties. There are systemic differences between these and it takes the experience and knowledge of a professional to ensure disposal repair is done correctly. Wear and tear can be responsible for some issues affecting a garbage disposal, but most times it is due to the fact that people put things down a garbage disposal that are not meant to be broken down in that fashion. For example, any type of grease should not be poured down a disposal. The same rule applies to fats or oils. Hard foods should also be disposed of in a different way. And although some foods may seem as though they can be broken down by a garbage disposal, certain kinds should always be discarded in a trash can. This includes banana peels and other fibrous food items such as celery and other fruits and vegetables. The team at Plaza Appliance has accumulated many years in this industry and we pride our business on quality work and integrity. Our technicians will always quote a fair price and recommend only the repair work that is absolutely needed. We also break down the problem and solution so that every customer has a comprehensive understanding of what is going on with their system. Website Development, Search Engine Marketing and Online Advertising by Leads Online Marketing Charlotte NC.